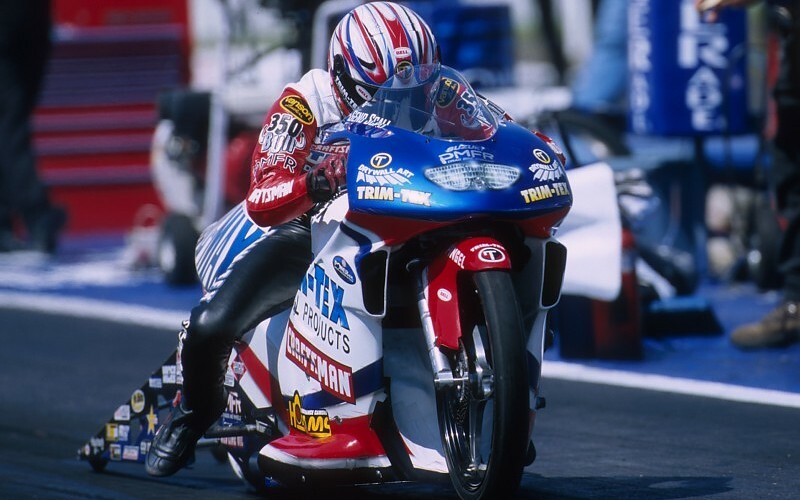 One-Time Champs in Pro Stock Motorcycle? Their Reunions Are Very Small. You hear the term “one and done” a lot these days in almost every sports community. That appellation refers to a single instance of noteworthy achievement which fails to be repeated by the same individual or team. Example? 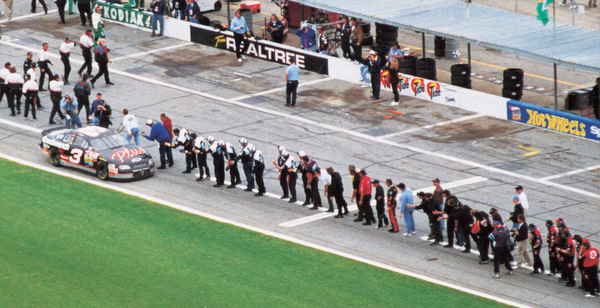 In motorsports, maybe the best known example is the late Dale Earnhardt Sr.’s 1998 victory at the Daytona 500. Of course, he won seven NASCAR championships so he could hardly be described as a chronic “one and done”. The list of other NASCAR greats who rang up a single career victory in stock car racing’s biggest rowdy-dow is so long, I stopped counting at 20. The same with NASCAR championships. A slew of drivers bagged but a single title. Of course, the first NASCAR champion was crowned in 1949 (Red Byron), so you would certainly expect there to be more than a few onesies over that long stretch. 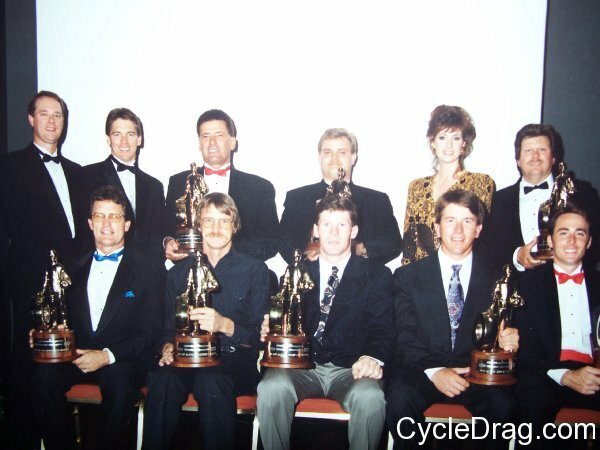 The NHRA awarded its first season championship in Pro Stock Motorcycle in 1987. The man who epitomized both excellence and professionalism in that category for the better part of a decade, the late Dave Schultz, earned that big prize and would go on to win five more for six altogether—which remains the most in PSM history—at least for now. 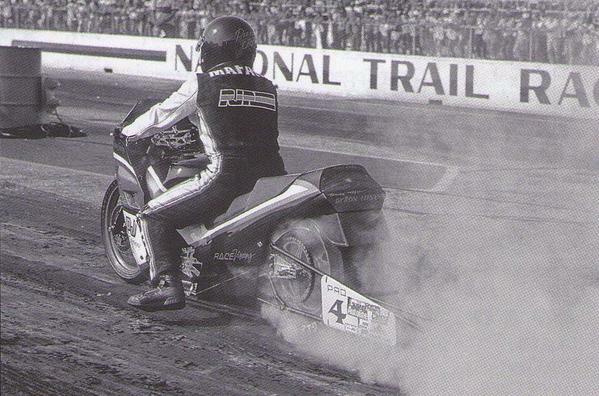 Between 1987 and 1996, only three racers won NHRA PSM titles. Schultz and his arch-enemy, the late John Myers, combined for nine and John Mafaro” squeezed out one. We’ll get back to John later. 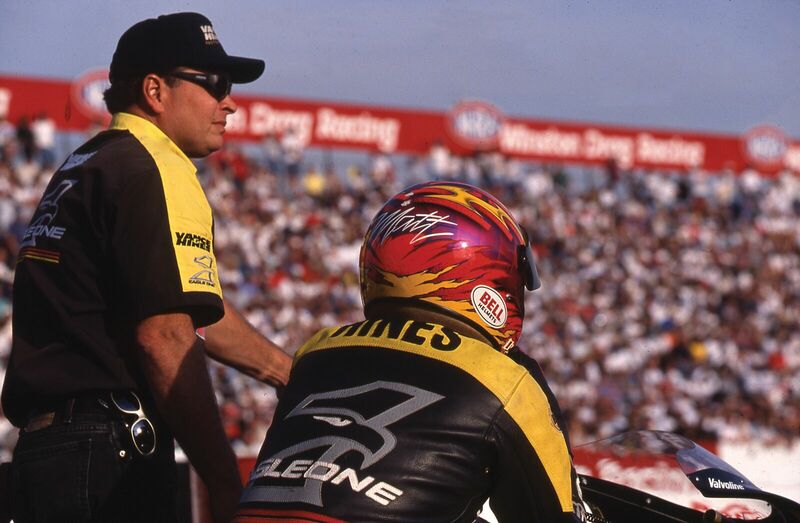 Matt Hines became the first PSM rider in NHRA history to win three straight championships in 1997-1999. Angelle Sampey then equaled that feat between 2000 and 2002. Not be outdone by his big brother, Andrew Hines collected the perfect Hat Trick from 2004 to 2006. That has led to a total of five and most PSM observers are convinced Andrew will almost certainly eclipse Dave Shultz’s half-dozen crowns before he goes into retirement. 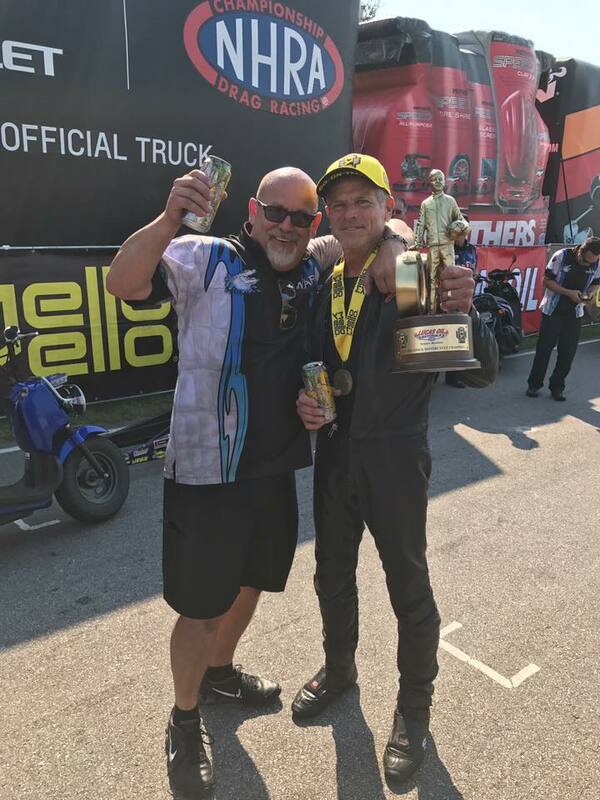 Andrew’s Vance & Hines teammate Eddie Kraweic won a fourth championship in 2017 and may also be on his way to another bunch of PSM titles in the foreseeable. OK, so Hip-Hip-Hooray for the Alpha dogs in Pro Stock Motorcycle. But let’s also raise a glass to the bike racers who enjoyed their 15-minutes of fame and one single world title amidst all the noisemakers and confetti that were directed at the multi-time champs. 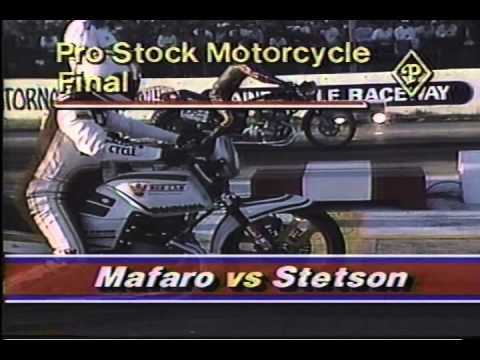 In 1989, while the Schultz/Myers insurrection was laying waste to the PSM class, “Pizza John” Mafaro used a heady mix of creativity and a steady application of his racing skill set to pull an end-around on Dave and John and score his first and only championship. A successful proprietor of an Italian restaurant in New York (hence his nickname), Mafaro found a way to combat the superior power and performance of Schultz—whose Crew Chief, Greg Cope, was an engine building wizard—and the equally formidable horsepower of Myer’s team owner and engine guru George Bryce, by applying his own homebrewed approach to aerodynamics. In fact, it was Mafaro who popularized the technique of the racer sliding back on the bike’s seat, assuming as horizontal a position as possible after launching, and reducing the drag created by the racer’s body when sitting upright. Had anyone laid the odds of Mafaro winning the championship that year, something like 100-to-1 wouldn’t have been considered outrageous. 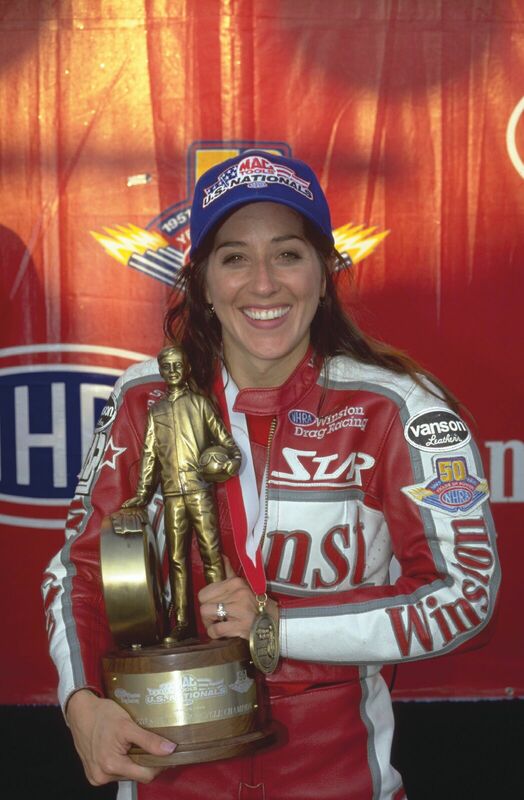 Sandwiched between the three world championships won by Angelle Sampey in 2000-2002 and Andrew Hines three-fer in 2004-2006, you’ll find the name Geno Scali, your 2003 NHRA PSM champ. What made Geno’s championship so remarkable is that the PSM class was in a state of serious upheaval in the early years of the New Millennium. 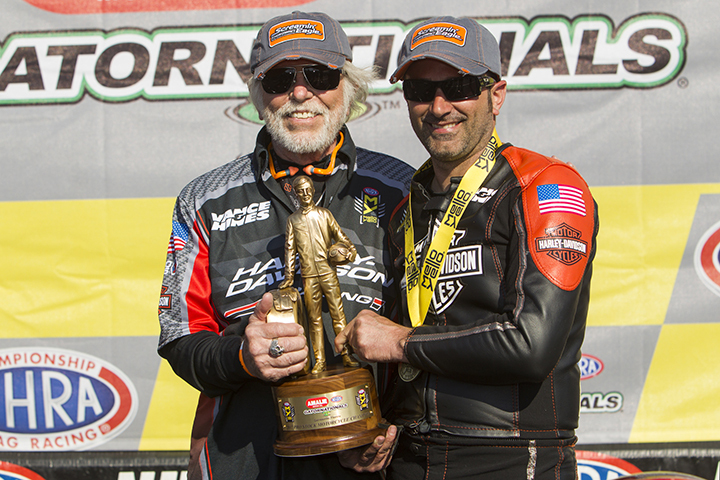 Harley-Davidson and Buell were changing the tune in the category while the NHRA was performing some serious slight-of-hand with the rules to help the Asian nameplates remain in the game. Revisions seemed to be coming down from Glendora on a daily basis. It was just a little chaotic. Multi-bike teams weren’t exactly a new thing at the time since George and Jackie Bryce’s Star Racing had been fielding two bikes for years with John Myers and Jim Bernard in the saddles, but Vance & Hines had added even more pressure on the single-bike outfits to maintain some relevance and in reality, anyone coming to the races with one scooter was at a distinct disadvantage. 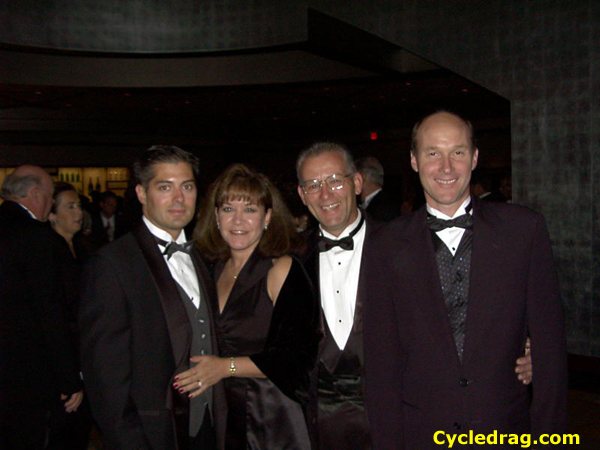 Geno Scali with wife Donna and teammates Earl DeGlopper,and Joe Koenig. 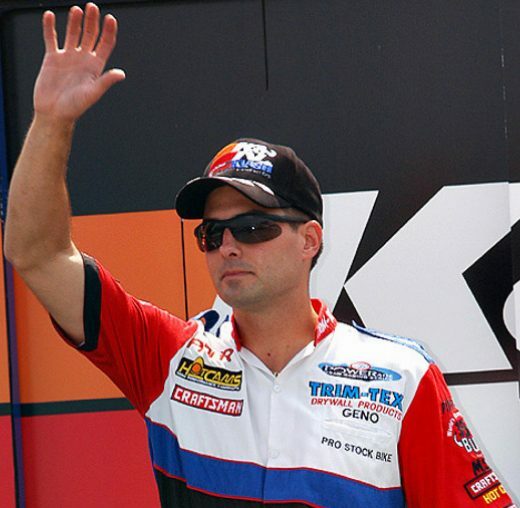 Joe Koenig, the president of Trim-Tex Drywall Products and an accomplished bike racer in his own right, had formed a racing relationship over the previous several years with Geno before establishing a partnership in 2003 that would take them into the NHRA’s Pro Stock Motorcycle hunt. It was that partnership that gave Team Trim-Tex the resources to defy the odds and run with the heavy hitters in PSM. The experienced and battle-tested veteran bike tuner Earl Deglopper, who had tuned the bike of Paul Gast the previous seven years, played a key role in Scali’s 2003 championship—his only one to date, at a time when the heyday of single bike champions was on the decline. 2009 was a banner year in the NHRA for first-time champions. 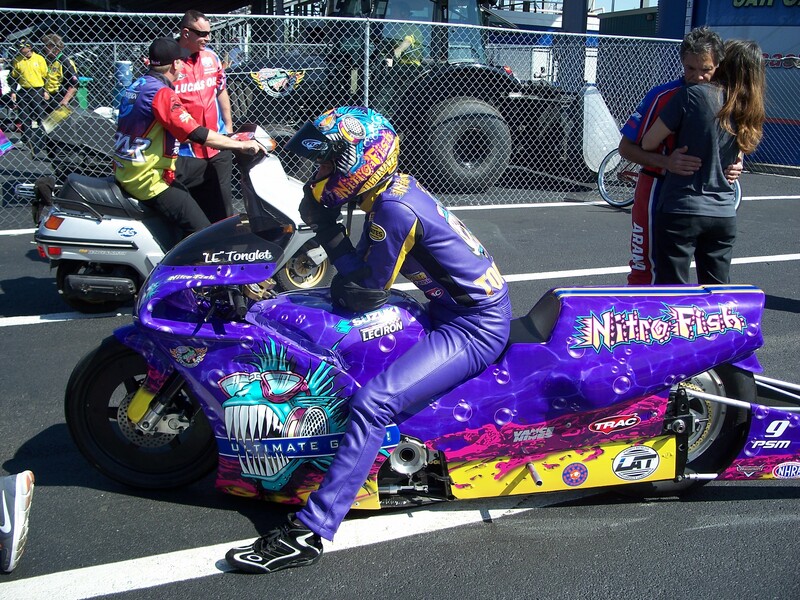 While Tony Schumacher was picking up his seventh Top Fuel championship, Robert Hight in Funny Car, Mike Edwards in Pro Stock, and Hector Arana in Pro Stock Motorcycle were all no longer championship virgins. 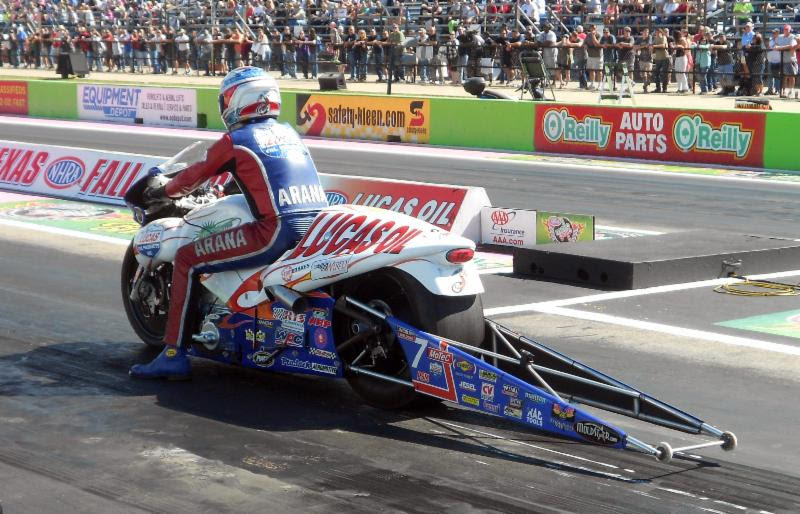 For Arana, the beloved patriarch of the racing Arana family, his 2009 season was highlighted by not only his first career title, but a career-high five national event wins and his first ever trip to the winner’s circle at the U.S. Nationals. His two sons, Hector Jr. and Adam, have all staked out career paths that may someday overshadow the on-track resume of their dad, but Hector Sr.’s ’09 championship while surrounded by the likes of Vance & Hines, Star Racing, and soon-to-be two-time champion Matt Smith, proved that age and experience can somehow triumph over youth and enthusiasm. Speaking of youth and enthusiasm, our next “one and done’ brings us to the following year, 2010, when youthful second-generation racer L.E. Tonglet emerged from backstage to wrap up his first and only championship as this is being written. Son of longtime bike racer Gary Tonglet, and younger brother of GT Tonglet, who also has fair amount of motorcycle drag racing under his belt, LE (Louis Earl) has traveled from the lowlands of Louisiana to the upper echelon of the PSM class by virtue of his stunning performance in his championship campaign of 2010. 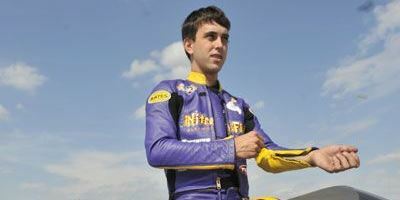 LE became only the third rookie in NHRA history to win a championship in his freshman season. (Can you name the other two? Give up? Cruz Pedregon in Funny Car in 1992 and Gary Scelzi in Top Fuel in 1997.) 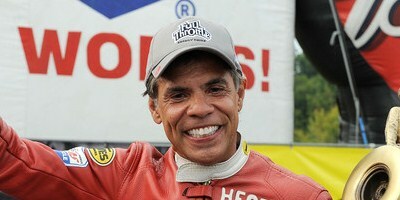 Like the aforementioned Hector Arana Sr. in 2009, Tonglet picked up his first career victory at the 2010 U.S. Nationals, won five events altogether that year, and also nailed down the 2010 NHRA Rookie of the Year honors riding the Nitro Fish Suzuki backed by drag racing favorite, Kenny Koretsky. 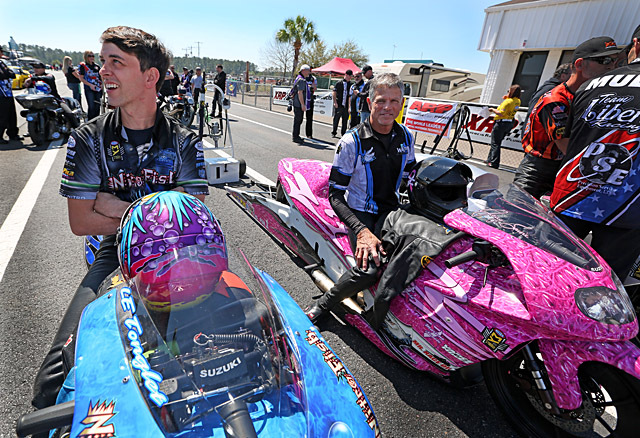 LE has been brought aboard the team owned and operated by 2016 NHRA Pro Stock Motorcycle champion Jerry Savoie and if that relationship pans out, young LE may not be among the ranks of the championship “one and dones” for much longer. Jerry Savoy celebrates another win. Nor Jerry Savoie. He is currently a member of the “one and done” fraternity earned by his 2016 title, but the likeable, gregarious alligator farmer has now graduated to a multi-bike strike force and based on his title season, it may not be necessary at this point to elaborate on his single championship status. It could be short lived. There’s little to indicate his 2016 season was a fluke and even less to convince anyone his first championship will be his last. We’ll pick this back up when the 2018 Pro Stock Motorcycle champion is crowned. 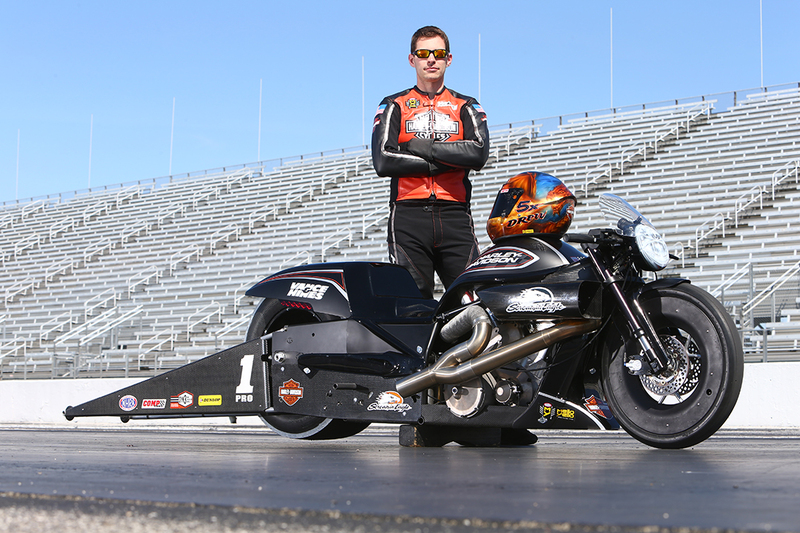 Big thanks to Cycledrag.com feature columnist Bill Stephens for this piece. 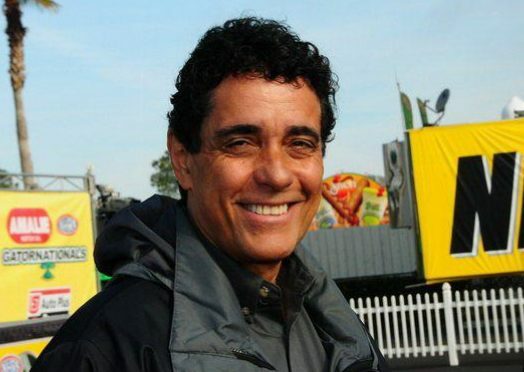 Stephens is a respected motorsports journalist who has worked for nearly every major organization. Currently Stephens can be seen on the Mecum Auction telecasts on the NBC Sports Network.